Change it up in 2017 with NEW Colour Vibe – wash in hair colour that is fast to apply as well as being totally fuss and mess free! Simply apply in the shower when washing your hair for maximum impact – with minimal time and effort required. Colour Vibe’s convenient and conditioning nature means you can start the week as a blonde, try Wednesday as a red head and the weekend partying with pastel tones. Or mash it up whenever you fancy with every colour in between. Colour Vibe is good to go wherever the mood takes you! How To Get The Vibe Simply wash your hair and shampoo as normal for a clean base to start from, wring out any excess water, then apply your chosen Colour Vibe and comb through to the ends to ensure an even application. Leave on for 5 minutes (or longer if you want a stronger colour), rinse thoroughly and condition as normal. 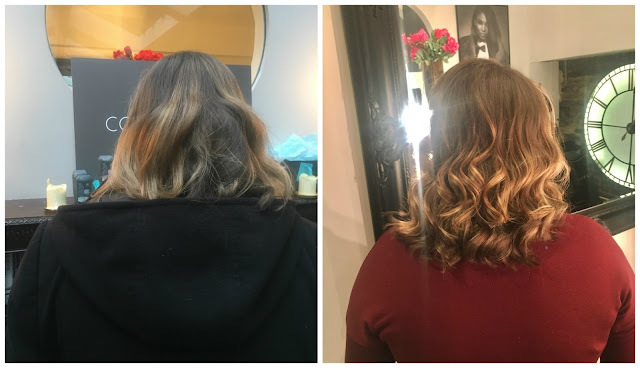 I was lucky enough to put these shades to the test and opted to try out Ash Blonde from the blonde range of colours and below are some before and after pictures of my hair. It is worth noting that of course in one wash my hair was not going to become bright blonde but what it did do was lighten the lighter blonde parts of my hair, which I was really impressed with. If you fancy giving these a try then Colour Vibe is available exclusively at Boots and Boots.com priced at £2.99 and right now they are on a buy one get one for half price, so if there is more than one you want to try, then now is the time. • Colour Vibe won’t darken or lighten hair - blondes should use different blonde tones and pastels, mid tones should use mid reds, dark browns should use darker reds and chocolate brown. A shampoo that nourishes your hair and enables you to try out many different colours? That sounds amazing! I just reviewed something similar, but might have to give these a go next. They're also a fab price! These are such great value! I'm going to have a look for these tomorrow. oh wow that looks fab and good to know they work too! Will keep an eye out for them! Flipping heck, for the price it's worth giving it a shot isn't it! Looks like it gave your blonde a lovely boost. Looks so handy! Does the colour fade badly as it washes out or is it okay? Oh wow this looks very interesting, I might give one of the blondes a go! Great price too. Your hair looks beautiful Rachel. These sound great! If I had light hair, I'd definitely be giving them a go. These seem like awesome shampoos! I'll have to try them once I grow my hair out. Ooooh nice- your hair looks gorgeous. Such a coincidence I saw these in Boots the other day and was tempted to get one even though I haven't been thinking about dying my hair. They're so cheap I might give it a go. Wow they are a bargain for that price. I use professional level products myself but these look good and I love the shade of pink! Sounds great. I wish my hair were lighter so I can try a bigger selection of colours. Your hair looks fab. I love the shade you are rocking. These products sound lush. Good price too. I had brown hair with blonde low lights and tried the mahogany shampoo and now my hair is red and won't wash out - can anyone help..?